Best MIDI Keyboard for Beginners for $100, $200 and $300 – 2019 Update! Best Headphones for Classical Music – 2019 Update! Best Condenser Mic under $300 – 2019 Update! Best Mics for Kick Drums and Bass Guitars – 2019 Update! Best Camera for YouTube- 10 Best for 2019! best electronic drum set – 2019 Update! Best Kids and Juniors Drum Sets – 2019 Update! Best Preamps for Drums – 2019 Update! Best Soprano Saxophone – 2019 Update! Best Throat Lozenges for Singers – 2019 Update! 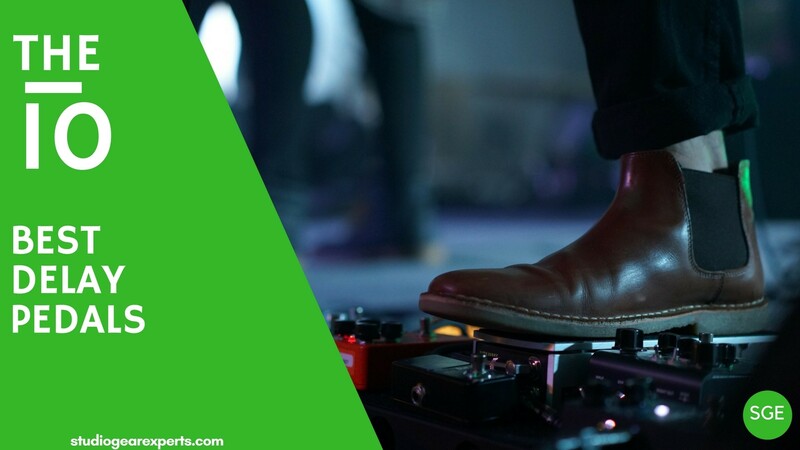 Best Looper Pedal for Guitars – 2019 Update! Top 5 Best Laptops For Video Editing – 2019 Update! If you are fond of playing the guitar, enriching your music is one of those things that make you as a guitarist stand out. With a guitar delay pedal, you can create excellent echo effects and harmony which livens your music style. But finding the right effect is not always the easy part. At least not with the many types of delay pedals on the market today. You’ll encounter three different categories including; tape delay pedals, analog, and digital delay pedals. Digital delays are the most popular as they produce perfect echo with long delay times. Analog delays produce natural sounds but cannot provide delay longer than 300 milliseconds with ease. Tape delays, on the other hand, are the most expensive mostly because of their large size and strikingly natural sound. Whichever effects you want to create, we are here to give you some of the best options on the market. These brands are versatile. They are those that you’ll find on every pedal boards with some of the most sought features. They apply to a wide variety of genres, so buckle up as we find out what makes them unique. For all ambient musicians out there, the Valeton Coral Echo is one versatile delay pedal with 11 high-quality delay algorithms. It is modeled with a digital circuit to provide an accurate delay in the purest form. You’ll like that it gives you many possibilities in a very practical sense. If you are an experimental musician, finding your unique sound is fast and easy with the Valeton Coral Echo. This model comes in a small stompbox design. It makes it easy for you when transporting it to different music locations. To select the various presets, you just have to use the big, white knob at the center of the device. It lets you choose such sounds created from analog and tape delay as well as lo-fi emulations and tube effects. With the aluminum die-cast construction, this device boasts a heavy duty construction. It is deemed to last in great condition over many years of use. The footswitch is a true bypass which means it is a top end as it produces crystal clear echo signals. All the presets have an evident natural sound. One of the most impressive aspects of using a tape delay pedal is the high flavor and quality of sound. The Empress Effects model is a device that matches up to this expectation thanks to the rich and lush sound it produces. Its signal to noise ratio is at around 103dB. It features tap temp with ratios. This helps in setting the tap delay speed as well as make fast tempos through the ratio selection. This delay pedal has a true bypass. It lets you have crisp sound that’s unattained by many other delay pedals. You can also use buffered bypass with trails to help enhance the signal. With the buffered bypass, you can say goodbye to popping and even expect sustained quality on all your sounds. You can customize the tape delay to suit your specific needs with the advanced configuration setting that is pretty easy to use. Weighing in at only 1 lb, this model has a dependable die-cast aluminum cover. It is resistant to rust and corrosion from regular use. You’ll notice that the knobs are well-aligned such that it becomes quick when choosing the different presets. Other controls include the four switches to help toggle through modulation, low/high pass filter, delay time and the other presets. The Boss DD-500 is one of its company’s best sellers. It showcases some handy features including an incredible design. It explores digital circuitry with a triple footswitch. Its controls setup also draws attention to what it has to offer. The 12 delay types, physical knobs, level tone, feedback, and mod depth are quick and easy to reach. The DD-500 benefits from more in-depth editing controls which we can’t say about the older DD versions. You’ll fall for the crystalline sound quality owing to the 12 delay modes. Apart from the first five which you may have experienced with the previous models, the DD-500 also has vintage digital, SFX, pattern, Slow Attack, Tera Echo, and Shimmer effects. With such a wide variety you’ll be able to explore as much as you’d like for your genre. It’s a delay pedal that makes your music memorable more so if you are an adept vocalist. When it comes to the triple footswitch, you have a pedal that can control tap tempo, two patches, bypass, and delay back selection. The footswitch can be assigned different functions from the layering of different patches to producing unique sound effects like twist and warp. The footswitches are all metallic with a narrow design. They have an LED attached to them making it more useful for stage performances. With a full 800 milliseconds delay, the Boss DD-3 has slowly risen to the top of the music industry’s standards. First produced in 1986, this delay pedal is sturdy, compact, and simple to operate. Just fit it in your pedal board and start enjoying the three delay time modes. You have a 12-bit delay that combines both analog and digital effects for unique stage performances. On this stompbox design, you have four switches that control the modes, feedback, delay, and effect level. It meets most modern standards from the delay time to the volume on the FEEDBACK. With only four knobs, it means you have some limit on the tonal effects, but this pedal has improved sound quality. It is excellent for starter guitarists who don’t need to waste time mastering different controls. This is a simple delay pedal, but it can apply to many music genres. For those who use acoustic guitars, it has a satisfying sound that takes your tones to a higher level. You’ll also love that it is shred-friendly, and it responds perfectly to overdriven sounds. Looking at the chassis, it is a rugged, metallic cover that protects it from damage. Not to mention, you can power this device using an AC adapter or a 9V battery. The Line 6 DL is a notable delay pedal in the world of guitarists. It has over ten years on the market, and it remains as reliable as when it first appeared on the market. It has digitally modeled effects that include 16 vintage delay effects. But it has an inbuilt looper that has a 14-second recording time. It becomes more practical to use this looper to attain a longer recording time. This is achieved by setting the speed to half before you start recording. The DL4 processes in true 24-bit stereo. This means that the right signals stay on the right while the left signals remain on the left. It lets you create a full stereo effect since you can run two different signals on two separate amps. The three programmable presets are perhaps the best for live performances. You can store different presets and also get real-time control of these effects through the expression pedal. This delay pedal can run for 30 hours thanks to the four C batteries provides. Better still, you have the optional PX-2G adapter to use when you want to connect directly to a power outlet. You can take it just about anywhere from outdoor performances to road trips away from civilization. Michael Angelo is best known for his advanced music career. Appearing in top music magazines and even named as the world’s No.1 shredder by the Guitar Magazine, Michael Angelo uses one of the most remarkable delay pedals. Tom’sline Engineering is a 3-in-one design model. It utilizes one footswitch to toggle from echo, mode, and normal functions. You can create the most desirable delay as it has endless sound repeat counts and a max delay of 838 milliseconds. With the time and level controls, it lets you balance out the effects creating pleasant sound. You’ll appreciate that it has a stop bar that prevents the accidental move of buttons. This way, you’ll be on top of your game even during live performances. This delay pedal explores a very compact design. It is barely the size of an iPhone weighing in at about 4.6 ounces. You can stuff it in small places including your pockets. With the hard aluminum case, it is impact and shatter-resistant. So don’t mind the constant foot tapping especially for hard rockers. It is a solid device that will be a worthy investment. If you love the sound of a real analog effect, then you will find the MXR-M169 irresistible. You should not expect any looping or tap tempo functions, but the sound quality is outstanding. It explores bucket brigade technology which produces a rich and warm delay. With this delay pedal, you get up to 600 milliseconds of delay time plus optional modulation through the top-mounted switch. This model utilizes a three-knob layout which includes the delay time control, MIX, and REGEN functions. The delay knob controls the rate of delay; the MIX operates the delay level while the REGEN handles the number of repeats. All these operations are in a compact pedal, but the buttons are large enough for simple dialing in. It also has two inbuilt trim ports which help in controlling rate and width of the modulation. This model is stage-ready. It has blue LEDs for easy reading on the inputs, and it operates on 9V batteries. It also has the option of using an AC adapter. Its flexibility is a significant advantage for every professional and on-the-road guitarist. The Carbon Copy is available at a super-friendly price considering that incredible guitar experts like Billie Joe Armstrong have found room for it on his pedal board. The Behringer VD400 is a model you definitely want to consider if you look forward to hyping up your sound quality. It explores the unique old-school bucket brigade technology to bring out effects you have not experienced with any other analog delay pedal. It has this unique ambiance that is clear and yet with some aura added to it. It provides you with up to 300ms recording time. This is a little stompbox with dedicated Echo, Intensity, and Repeat Rate Controls. You’ll feel like going back in time when music was cool rock and roll. It gives you a clean signal thanks to the advanced noise reduction circuit. You can also run all signals through separate rigs through the dual outputs. For stage performances, the blue LEDs will let you know when the unit is ON for seamless operations. Pedalboard integration is also effortless through an AC adapter or just a standard 9V battery. It promises durability seeing that the plastic case is extremely rugged for regular use. If you are just getting into the world of delay pedals, the TC Electronic brand is regarded with esteem in the music industry. Their mini model comes with some unique properties among them audio tapping and TonePrint capability. It has a free TonePrint Editor which we’ll look at shortly. Just like many other compact pedals, it has a three-knob layout that makes it easy to dial in and be in control. With audio tapping, you can set the delay time by strumming the guitar as you hold down the delay pedal. It gets you better at coordination so that you can mix and reverb on the pedal board. If you wish to utilize some of your favorite artist’s delays, you can have access to the flashback-mini function. With the free TonePrint Software, you’ll be able to download and customize unique tones. The TC Electronic model allows you to choose dynamic delays, analog, and even tape delay effects. You have an ultra-small pedal that can fit seamlessly into the most packed pedal boards. It does not have massive modulations, but you’ll love the sound quality. The tone is not only warm but also playable in the first instant you get to listen to it. It’s a quick way to start enjoying the perks of delay. Donner Yellow has continued to win many hearts over. From its striking yellow exterior, it features dependable features that bring out a rich tonal quality. It has a PT2399 digital chip that steers it away from being purely analog, but you will appreciate the sound it brings along. It helps to counter the diminishing quality of analog delays. You will like the build of the Donner Yellow. Although it is in a size that can go into any pedal board, it packs some weight on it. This is because of the tough aluminum exterior that ensures it will not shatter with heavy stomping. You’ll also like the cute graphics that have large symbols. The three knobs allow you to take control of the echo, time, and feedback of the repetitions. You may not like that the knobs are slightly small since it means that you need to be more precise on your footing. It has a single input and output with a true bypass mono pedal. It powers through standard 9V batteries or an AC adapter. The ON/OFF button is quite large, and you get to see the status on an LED indicator. You get no distortion and no hum with the Donner Yellow. No wonder it emerges as the most sought delay pedal on our list. Creating your perfect tone is a matter of choosing the most efficient delay pedal. We hope you can find that one model that has the effects you desire to fulfill your music style. We think that these brands have great features that are easy to adapt and drive your music to greatness. Remember not to compromise on the features when buying a budget-friendly model. It’s always good to strike a balance when shopping for the best delay pedal. Quinn is an audio engineer who is passionate about music production gear. He's been a journalist profiling popular musicians and the gear they use. When not helping musicians and audio producers in studios, he's scouring the market to find the latest gear and music production tech. •	To become a trusted resource site where people can learn how to start a music and photography home or professional studio. •	To provide the best and most reliable information on various studio gears and how to use them. •To research and review the best studio gears on the market. •To create and nurture a community of supportive individuals who are passionate about studio gears. Studio Gears Experts is a participant in the Amazon Services LLC Associates Program, an affiliate advertising program designed to provide a means for website owners to earn advertising fees by advertising and linking to amazon(.com, .co.uk, .ca etc) and any other website that may be affiliated with Amazon Service LLC Associates Program. StudioGearExperts is also participant in various other affiliate programs and we do get commissions if purchases are made through the links on our website.